The patchwork altar frontal, like painting the Forth Bridge, seems never to finish though logic tells me one day I shall lay it all out and the patches will be complete. A couple more non altar frontal stars to divert you. 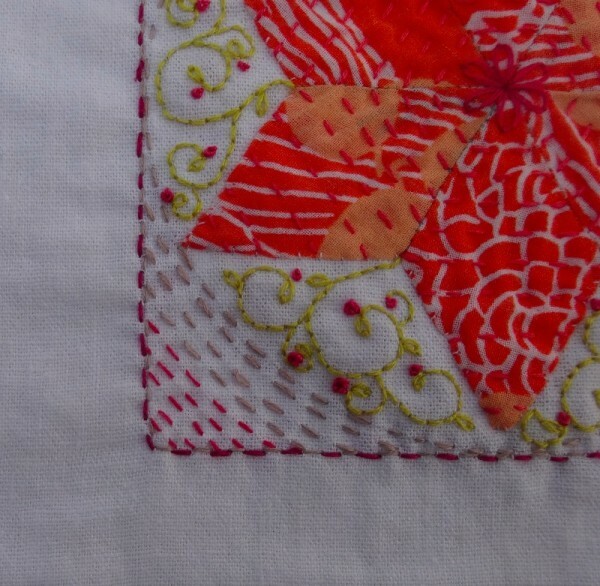 I have become a trimmer – of patches, things needing to be done and time. At the moment I am only doing what is absolutely necessary, hence all the stars have gone to Vietnam (to be given away as presents) with no names embroidered on them and unmounted. Shame about the names but it is true the Vietnamese know exactly how to frame embroideries and that they will do it well and very cheaply. On Friday our newly resident female duck appeared from out of a shrub in the vicarage garden followed by a line of 10 ducklings. We have seen the mother since then, but no ducklings and I have a heavy heart about their fate, especially since a local duck owner with a big pond (though I’m not sure you do own ducks) said they lose lots of ducklings to herons, kites and crows, not to mention foxes and domestic cats. Poor duck – obviously a good sitter but with the odds are stacked so heavily against her caring for 10 little ones, it is heart rending to think that not even one may have survived. Heard the first chiffchaff of the season on Saturday but there’s not a hint of a cuckoo and it seems likely that this will be another year with no cuckoos. And so uplifting on a dull day. I love to hear about your bird sightings, and am so sorry about the ducklings. Nature is so cruel sometimes! Lovely stars they have all been, even without names. The dramatic landscape you’re currently in couldn’t be more different from our dimpled chalk hills so it’s very pleasing to hear that the bit of nature wandering into our very tame back garden interests you. Very glad to hear you are enjoying the stars – thank you for your comment, Amara. Those hexagons you showed a few posts back would work very well with embroidery and I love your recent pieces of appliqué. 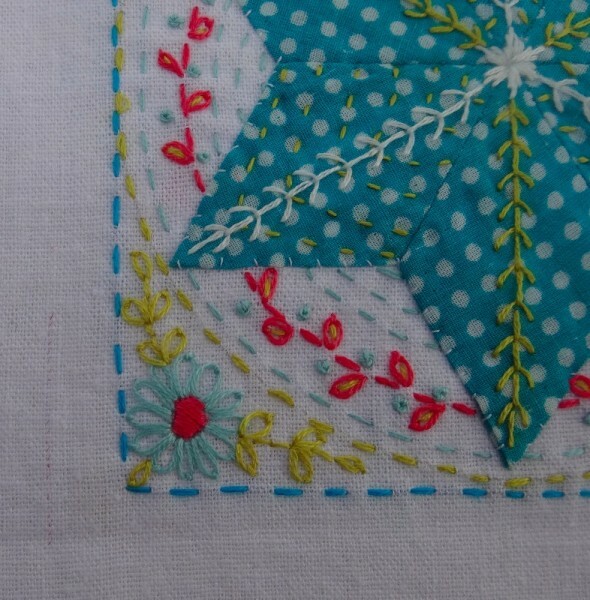 I’m glad that the embroidered stars are giving you ideas, Elaine. No trouble to be blogging as it is such a welcome contrast to debating whether and what we should get rid of and then boxing things accordingly. At least I don’t have the immediate needs of family life to grapple with at the same time. 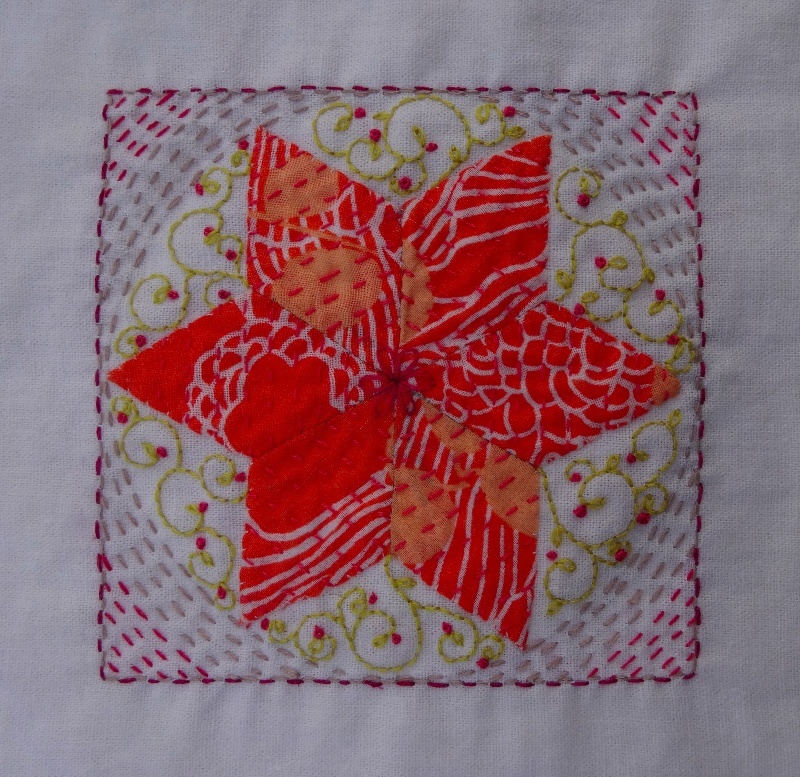 Hello there again… Your stars are just so pretty and I just know they will twinkle away on the altar frontal brightening up the day for all. I have been listening to something that turned up on my Facebook page, the song of a Blackbird for Dawn Chorus Day tomorrow… I love their song and now I feel very homesick. Stars, stars, everywhere are stars at the moment. 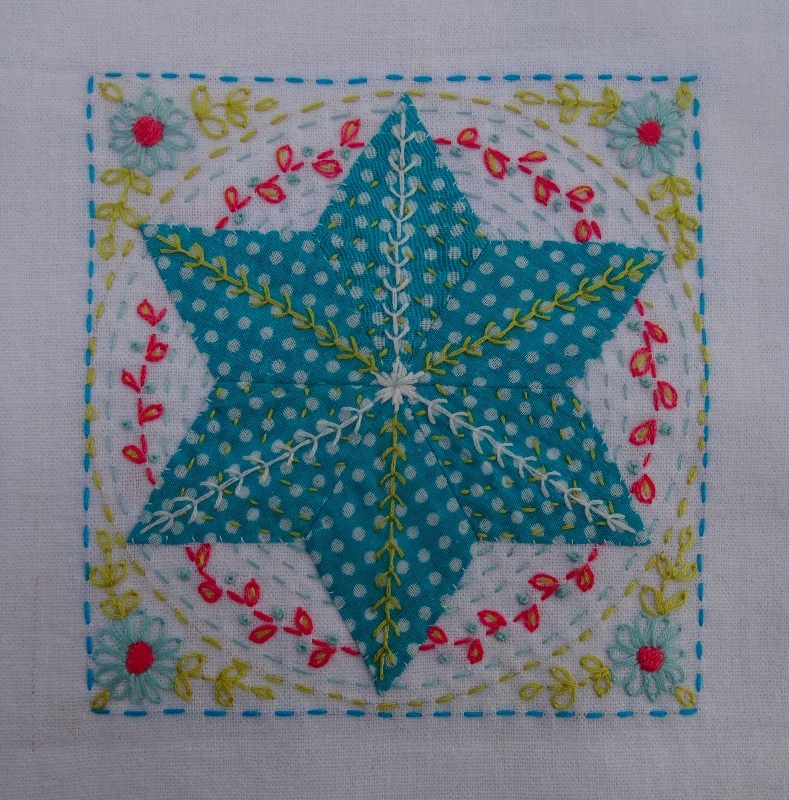 These bright coloured stars are actually ones made (by daughter No 2 and embroidered by me) for daughter No 2’s colleagues in Vietnam. At the same time as I am blogging about them I am also working on ones for the altar frontal which are embroidered flowers on a black background. Sorry, I know your life is to full to take in this confusion and in the eternal scheme of things is not at all important – so I hope you don’t mind me wittering on. Are there no blackbirds in Australia? I believe there are Blackbirds over east unfortunately introduced by early settlers to make them feel at home. Over here in the West there are of course beautiful birds which I do love but no skylarks or blackbirds, as indeed there should not be. I am knitting an enormous Rowan jumper for my daughter… I really hope she will not disappear in it! It is a request and so of course I must complete it. Of course Australia has such unique flora and fauna. I should have given it more thought – blackbirds would scarcely be indigenous.It’s taken us a long time to realise introducing animals and plants where they haven’t been before is not a good idea. Good luck with the jumper – your daughter probably wants something she can disappear in!